How was your evening? Ours was very quiet… James Bond and Uno, followed by a blast from the past in the form of my meal… Coq au Vin and tomato juice. Not my usual way of seeing in the New Year, but one fitting I think for seeing out the year which goes down in the annals of our family history as the the one from hell. To be fair it wasn’t all that bad. It just had to be borne, to get to the other side, if that sorts of makes sense. Decisions made, the circumstances of the accident poured over and re-written or rather the facts recycled and re-scripted depending on who read the judgment and wanted to read into it and use it for whatever purpose in their world. This screenshot was of one of the many stories which found their way onto independent solicitor’s websites – despite the fact that it was totally untrue !!! But hey why let facts get in the way of a bit of marketing. I print it here merely as a warning to others not to use these companies if they are in need of serious help after an accident. So – moving on 2012 hopefully will give us some resolution and I can start thinking about restarting my life again. I found during 2011 it was totally impossible to keep everything going, and I just ended up having to accept I was only human after all, and do what I could do, and accept defeat in other areas. This made me sad, as my writing, painting, music and textiles are all part of “me” and make me the robust and rounded character that I am. You take any part of that away and I become destabilised and unable to make sense of the often bizarre world around me. Watching a programme about the Amish culture though has shown me a bit of way back. I know the culture has become romanticised in modern 21st Century world, the myth of a perfect lifestyle supported by the film with Harrison Ford in a few years ago. Like every culture I suspect they have their ups/downs and problems (recently there was a horrific story of a 15 year old shot dead by accident), but there is something about their values and their way of living which chimes with my values. I love their quilts and their uniform clothing. Everybody no matter who their status is wears the same/similar styles and are cautioned and guided to be plain, modest and community guided as they go about their business. The idea of living simply and considering others is a really good one for me. Not sure how that fits in though with my stash of fibres/textiles etc., and my gadgets (I so love my iPad) but I do only have a handful of clothes to my name and I have only two pairs of shoes, the hat thing would sort out my dodgy hairstyle, and I do try to consider the impact on others and take into account other’s feelings and systems which could be changed for improvement, when dealing with our issues. All very much work in progress as I rewrite my personal manifesto in 2012! So what am I up to this afternoon? I came across this top when watching one of the late night programmes about where somebody comes from – “Who do you think you are?” - America This was one of the Judd sisters. I loved this shawl, which seems to be more shaped than my favoured patterns, so I am going to have a bit of think about designing one using my oddments and giving it a collar and a bit more shaping. If anybody knows of a pattern out there in the ether already, please let me know, will save me some head scratching and I can get on with it. Off now to carry on with my Waterfall Cardigan. I am almost at the end of the second side, but having had a look at the handspun pile, will probably not have enough to finish without more spinning. I have struggled with my knitting for months now, not wanting to confess that I was getting incredible pain in my thumbs, and feeling very much of a wuzz about this, as well as everything else. Every time I knitted a few rows I was starting to feel very mortal, and just didn’t want to be reminded of loosing the solace and quietness of a hobby I love, as well as everything else. Strangely though a conversation with someone from ATOS of all places, spurred me on to sort this out. She was admiring my jumper at a recent medical and I felt quite sad that the jumper which gives me so much solace and comfort, having been knitted during the early times after Toby’s accident, was probably not going to be reprised. 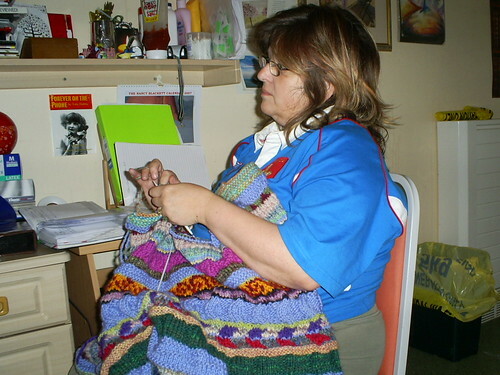 When I asked the lady if she was a knitter, she said she was but had had to stop due to pain in her hands. What I shame I thought and ….then the old me came out of the woodwork – the one which won’t be defeated !! - and I went and had a root through DH’s medical box – there is a cure for everything in there I am sure – and I found some gel which soothes arthritis – ok it was well out of date and the cap needed wrenching off with pliers… but I have been using this now for a couple of weeks and the pain is now eased, enough to enable the finishing off of Josh’s socks and get on with the waterfall.